Trick or Treat?!? That’s definitely a rhetorical question, cuz it’s always treat with my pups. Well, tricks are supposed to come before treats. 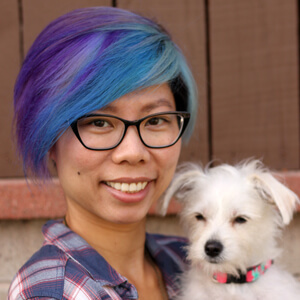 But we have been too lazy to make them do tricks, plus Lily memorized all the tricks by heart so sometimes she just starts doing the routine before we even give the commands… And even if we do give the commands, she just does the routine her way anyways and looks at us hungrily when she’s done. Eventually, we gave up and stop asking her to do stuff. So, THIS is where my last cup of pumpkin went… You didn’t think I would leave the pups out of all the pumpkin fun, did you? Of course not, every year, my pantry is filled with pumpkin for cupcakes, for pancakes, for pies, and for pumpkin dog treats! 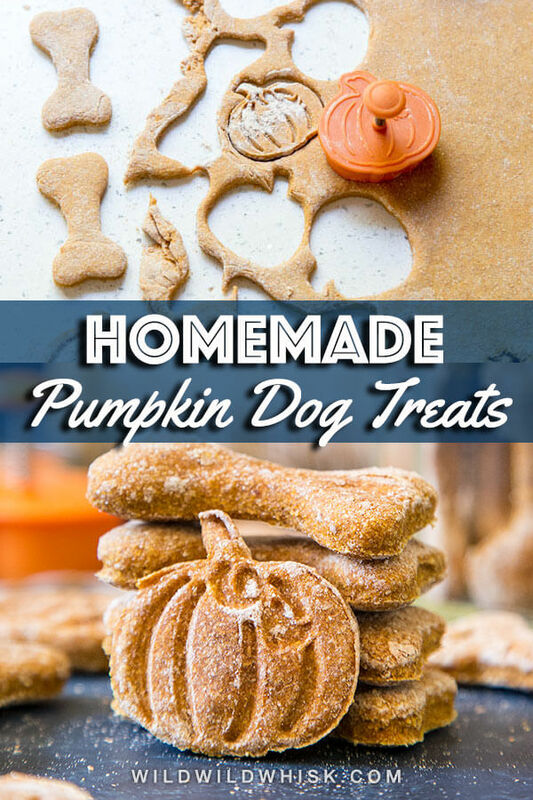 They love these treats, well… they love all the homemade treats in all fairness. And pumpkin is supposed to be very good for their digestive system, but just like with everything else, moderation is key! 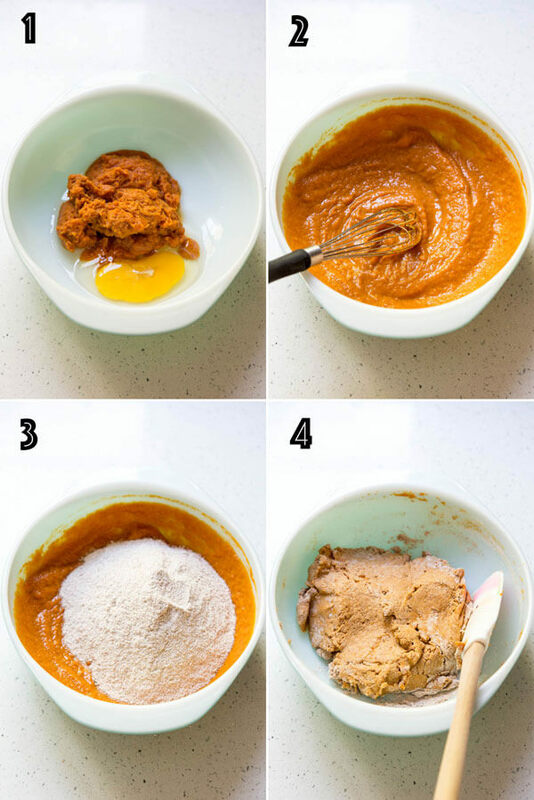 In a large mixing blow, beat pumpkin and egg together until combined. Add the flour and fold with a spatula until dough forms. You may need to use your hand to get all the flour to mix in. Turn dough out onto a well-floured board and knead a few times to get all the flour and dough pieces to combine and to smooth it out a bit. Roll dough out to 1/4” thick. Cut with a pumpkin shape pie/cookie stamp or just use a round 2” cookie cutter. Make sure to flour your cookie cutter to prevent the dough from sticking to it, especially if you’re using the cookie stamp. Place cookies on a parchment line baking sheet 1/2” apart and bake for 40 minutes. 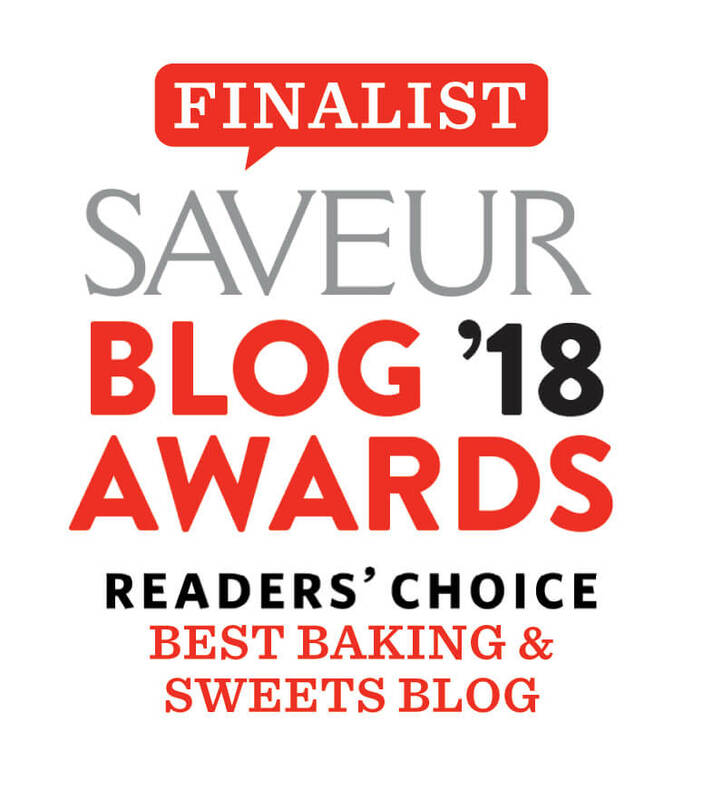 If you have to use two baking sheets, you could bake them one at a time or together with one sheet on the bottom rack and one on the top, just remember to rotate them half way through. Turn off the oven and leave the cookies in there to dry out overnight. Oh man, these are the cutest things ever! 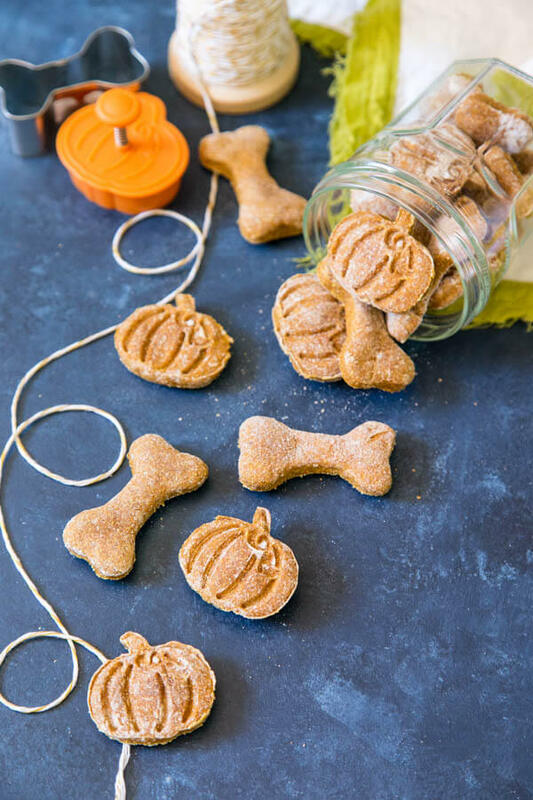 I feed my dog pumpkin all the time to help her get enough fiber, so I’m sure she’ll love these. 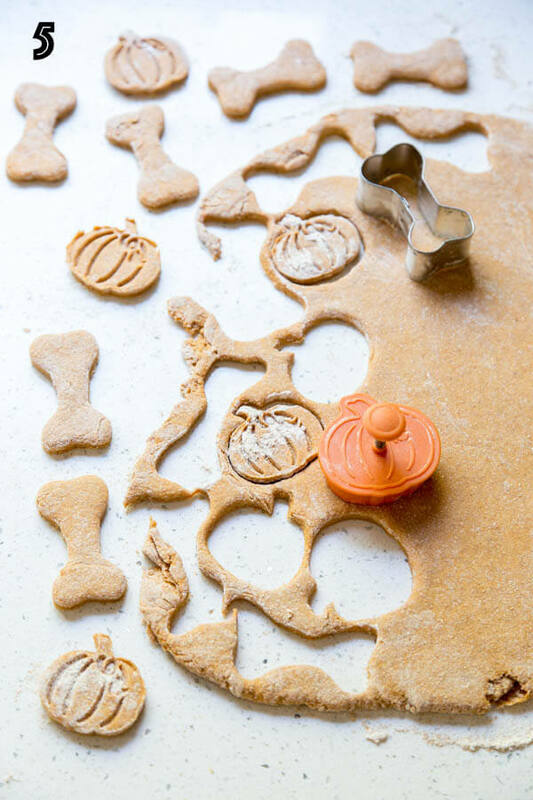 I’ll have to get a pumpkin cookie cutter ! Dogs should be grain free. They’re carnivores, not omnivores, and don’t really need carbs. Grains can tend to cause digestive upset or skin problems. Thank you for your comment and concern. 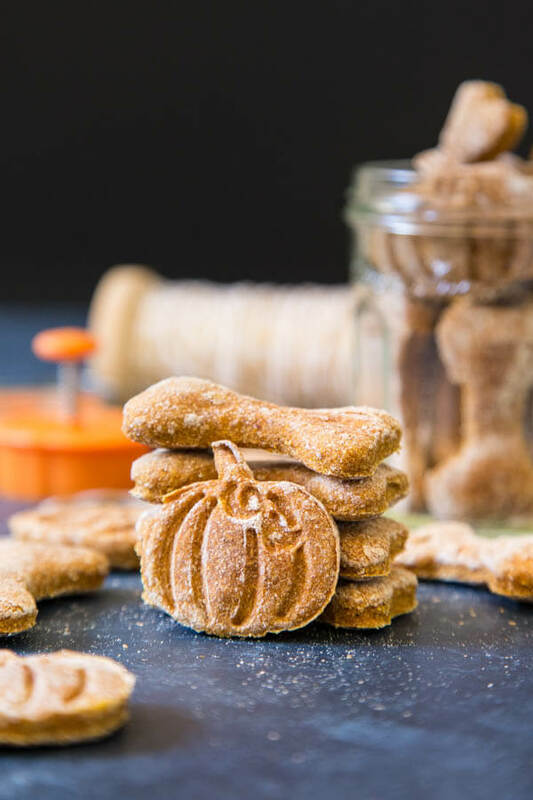 As I always state in these recipes for dog treats, feel free to substitute wheat flour with other type of flour to fit your dog’s diet. Mine are not on a grain free diet and they are perfectly healthy. Dogs are just like human, in term that each one is different with different tolerance to certain food, some have allergies and some don’t. So always use your best judgement when making homemade treats for your dogs. You are the only one who knows them best!